It's a strange life at times. I'm a New Yorker by birth and by heart. I've always loved the city: the life, the hubbub, the drama, the spectacle. So I certainly never thought that at sixty(ish) I would pick up and move to a remote corner of New York state, and end up living in a castle. But I did it, and I'm having the time of my life. Let me tell you a little about myself and how I came to know my dear, darling friend, Merry Wynter. Once upon a time there was a girl named Merry... I start her story that way because though she doesn't know it, I've always thought of her as a kind of fairy tale princess, only without the happily-ever-after ending. You see, she met and married my good friend Miguel Paradiso, a talented fashion photographer. I had known Miguel for years; in fact, I started out as his financial adviser, but our passion for travel, opera and classical music forged a bond of friendship between us, as unlikely as it seemed. People say that Spanish men are very macho, and Miguel was that, but he was also tenderhearted, intelligent, and kind. When he began talking to me about this amazing woman he had met, a fashion stylist, I almost groaned. Another industry insider? He had had his heart broken by such women more than once. But then I met Merry, and she was sweet and smart, a full-figured beauty. Miguel was a big man and favored voluptuous women. But she was more than just beautiful, she was thoughtful. She knew nothing about classical music, literature, opera... all of Miguel's passions, but she was willing to learn. She had an open mind and heart, and she was honest, with herself and with others. That was very important to Miguel, since he had been disappointed in love by women who cheated. And she was (and is) kind; our friend Shilo Dinnegan was a teenage model when Merry first met her, one of the half starved teenage waifs who populate the industry and usually fall through the cracks, disappearing without a trace to drugs, alcohol or abuse in some form or another. Merry took her under her wing, and as a result Shilo clings to her with a fierce loyalty that touches me deeply. When Miguel was tragically killed in a car accident after only two years of marriage I thought Merry would die of a broken heart. She struggled for years. Shilo and I tried to fill the void, but nothing really worked until... until she inherited Wynter Castle and moved here. The castle, Autumn Vale, the nearby town, the weird and wonderful folk... they and all that has happened since have filled a void in her life in a wonderful way. It's not the happily-ever-after ending I had hoped for, for my friend, but it is a new beginning, perhaps. I'm so proud of her, and in truth, this place, this castle, these people... it has all given me a new lease on life too. There is something about Wynter Castle and Autumn Vale. I know she feels she has to sell the wildly impractical castle, but if there is any way on earth she can keep it I'm going to figure it out. She needs this place, and there is a man here, the town's sheriff, who looks at Merry the same way Miguel did, like she is his beginning and his ending. I'm sticking around at the castle long enough to figure out if he could possibly be worthy of her love, because she deserves to love again. Miguel would want that for her. And that is the story of my friendship with Merry Wynter. I started out feeling I owed it to Miguel to look after her, but came to love Merry for herself. So I'm curious... how did you come to love your friends? What makes them special to you? 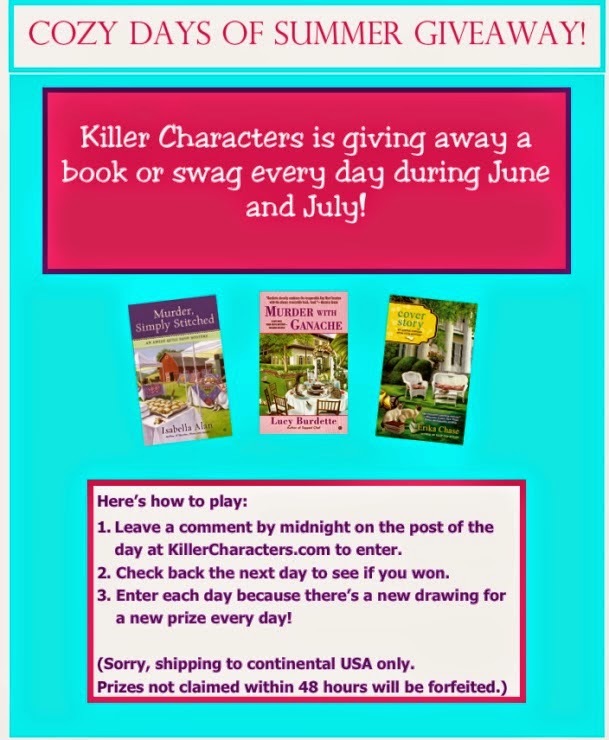 Every day in June and July Killer Characters is giving away books, and sometimes more in our Cozy Days of Summer contest! 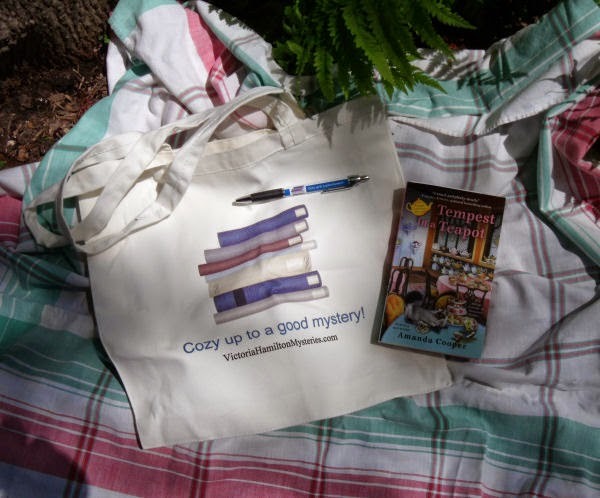 Comment here to enter to win a prize package containing a cozy mystery book bag, pen, and book. 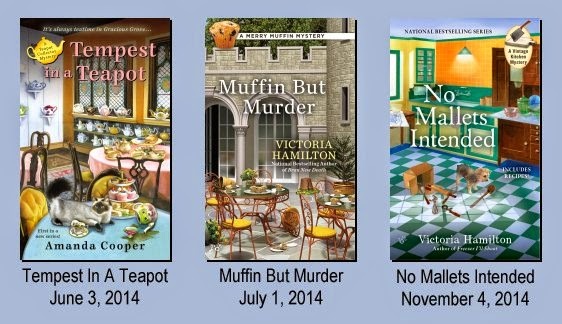 You can choose Tempest in a Teapot, Book 1 of the Teapot Collector Mysteries (written by Victoria Hamilton as Amanda Cooper) or Muffin but Murder, Book 2 of the Merry Muffin Mysteries. Please note: For the purposes of this drawing today only, entries can be from the USA AND Canada!! My best friends all are bright, funny, ambitious, and compassionate people! I think, the most important part of the friendship, is not to be forgotten, no matter how busy, stressed, worried one becomes.....time may pass, but, we do not forget each other. My best friends are intelligent and share the same likes in life as I do. My friends are there for me no matter what time, day or night and I'm there for them too! If any of us need each other for anything, we're there for moral support. I agree with the above posters about the friends we love: They are supporting, accepting, share many of the same interests and can be counted on during those life interference times. Looking forward to reading the books in this series. My friends are great listeners and supportive. I met my best friend online 15 yrs ago.....and I married him 11 yrs ago! One of the most important parts of friendship is even though you might not have sen each other in awhile it was like you saw them yesterday. My great friends are those who will go out to eat with me and talk for hours. My best friends are accepting, caring, supporting and good listeners. A cozy and a bookbag for the cozies! Wonderful giveaway! My best friend is my daughter! I came to love my friends because we share our hopes, fears and dreams. We have similar interests and love one another unconditionally. We overlook each other's flaws and shortcomings and accentuate the positive. My friends are loyal, mature women who I can count on to be there for me when I need them. These are just some of the reasons why I love them so much. I love my friends because we accept each other as we are and enjoy any time we have together. Friends share your life, through good and bad. As is said, "Make new friends, but keep the old...one is silver, the other gold." The longer you have a friend, the more like family they become. My best friends are loyal, supportive and always there for me. Is Tempest in a Teapot the first in the series? I cannot remember. Thanks! My besties are amazing and are always there no matter what. When we need each other we know we can count on being there. I My friends are very important and I love how we always take time no matter how busy we get for one another. Shared experiences and the ability to not only listen but laugh.... I love her books! I'd love Muffin but Murder. My friends are people I have known forever. We share the same faith as a basis for our friendship. My best friend Shirl is one of the kindest people on the planet. I can't imagine what I'd ever do without her friendship. I'm already reading Tempest, but would love a chance to win Muffin! all the above posters have commented so well and so eloquently on friendship. I can only agree! My friends are always there when I need them. And we always have fun when we are together. I choose the second muffin book. I have all the others. My friend Valarie is the most generous person I know. She has even cleaned my carpets while I was gone on a trip. How many have friends like that? What makes my friends so great is they know me and love me anyway! Your characters sound so rich in detail! Most definitely adding your books to the reading list. My closest friends kind and loving people whom I admire. We have fun together, but can be separated for awhile and reconnect as though no time had passed! Having friends who care through good times and bad is what life is all about. Friends who don't mind listening when you need to get something off your chest. New series? Woohoo! :-) More reading delights! My good friends are always there, even if we aren't able to get together as often as we would like. My friends are supportive and make me laugh, although we are miles apart whenever we do get the chance to get together, it's like we have never missed a day. Cute book bag - and a series from you that I have't read yet! My best friends fall into one of two categories, known since growing up or met through books. I have to say that the title Muffin But Murder is so clever. Definitely going on my TBR list. Love Victoria Hamilton's books:-) can't wait for the new releases!!! Yes, Victoria's books are a really good read. sounds fun!, but, her name is really Pish? My friends are a loving, listening, interesting group of girls. We giggle (even at 60ish) and cry together. We never judge but do offer advice LOL. We have been together for a long time and even if we don't see each other for a long time we can pick up where we left off. My friends are very different and we don't all hang out together but I have a special bond with each of them. My 2 best friends and I have been friends since high school, through marriage, divorce, births, and deaths for over 40 years. I love them dearly. My best friends are there no matter what is going on in my life, always there. My best friend died 2 years ago and I still miss her, I met her at a Internet cafe. We got talking because the owner said we were the only two regulars who drank tea. A few days after meeting her i asked her to help me move. We were the best of friend for almost twenty years. We had our ups and downs and were roommates more then once. We shared a moving truck accross the country when we both decided to move back home. We had grown up not far from each other. As I said I still miss her. I don't think I have a 'best' friend. I have friends, but no one that is extremely close, or long term. One time I was talking to a cousin about that. My sister makes friends easily and for forever. She has 2 very close friends and more close ones, even some who no longer liver near by. I, on the other hand, don't seem to have that knack. My cousin said to me something like this -- 'God gave you the personality He knew you would need. You have moved many times, and have lived many places [hubby was career Air Force 27 yrs and now is a United Methodist pastor]. You have many friends/acquaintances from everywhere, but it would have been hard and difficult to hold and keep close all of them over the years. God has allowed you to move on without regret, but knowing you would make new friends in each place.' That has been a great help to me because I can enjoy people where I am and not worry that I will be broken-hearted when I have to move again. My friends are there at the sad times as well as the good. I mayy not see them for a while, but we can pick up where we left off without issue. Just started Tempest and I am really enjoying it. I always say anyone who can put up with me is a true friend. I have fewer friends but the ones I have are close. 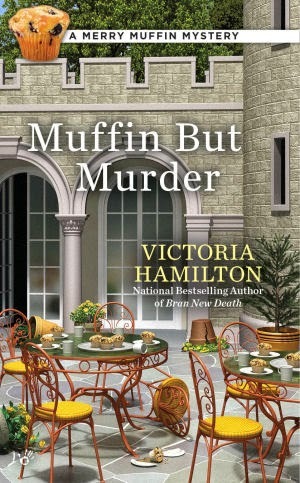 Can't wait to read the new Muffin Mystery. And my friends know when I would rather read a book than socialize. We laught at the same stuff but we have enougt differences to help us grow as friends. She loves baseball (Cubs baby!) and I love musicals/plays. So our girls night/weekend out will always be interesting. My true friends are the ones who have seen me through some rough times and not let me give up or give in. Missed doing this for a week....was away on vaca with limited connectivity! Love me a giveaway book! My real friends don't care what I look like or how I dress or how much money I make---we just enjoy each other's company and are there for each other when the going gets tough. My true friends love me the way I am. And I love them the way they are. Okay I have to admit I am a bit confused. I see here it says leave a comment to be entered to win but all the comments are about friendship. Did I miss a memo about what we needed to comment about? Well if I am going with all the people before me, I'd have to say friendship to me means finding someone you don't have to walk on eggshells around and someone who accepts you and all your flaws and doesn't treat them like flaws. I have one best friend and she's been there for me since I started needing someone to be there for me. I love her to bits and she loves me just the way I am! I sure would love to win this giveaway. I have been itching ot read a Victoria Hamilton book! I'm still in touch with my best friend from high school and along the way since 1965 when we graduated I've made some good friends who were co-workers but my best, best friend is my daughter! I'd love to read this series. I am drawn to people who are funny, compassionate, quirky, and curious about the world. I am drawn to people who are a bit eclectic, the women that revel in their uniqueness. I went to an all girl private school from grades 1-12. I am still friends with many of the girls from my first grade class. It is quite a feat seeing as I am 62 now! I don't even know if I can put into words what makes me come to love my friends - somehow there is a just a deep connection. Something that just tells you that this is a kindred spirit. Thanks for the chance to win! Shared experiences and admiration/respect set the foundation for good friendships. My friends are at my side in both good and difficult times. I have a core group of women friend's who mean the world to me. They proved they are loving compassionate friends by listening , showing up when needed without my asking and pulling me up with their continued support. When my 18 year old cat died this week, my best friend stayed on the phone with me all night. Now that is a true friend. We have mutual respect and value, nurture,and cherise our friendships. What we know to be true is we will drop everything and be there for each other. That is how my friends and I proved to each other we are true friends. After 50 women friend's are the best part of life and give me more support and love then anyone else in life. Thank you to all who entered on my day, and congratulations to Ronna Lord who won the prize package! At Killer Characters we really do appreciate all of you who take the time to read our blog and enter. Two notes to add... one of our little ways here is to ask for reader participation, so we usually ask a question at the end of the blog, and you are free to answer it in your comments, but in my case, at least, it was not something used to determine the winner. Second... I suppose to those who have not read my Merry Muffin Mysteries yet, it isn't clear, but Pish is a man, not a woman! At my book launch for Muffin But Murder I will be on Dru Ann Love's wonderful 'Day in the Life' blog on July 28th, and you will be the first to find out what his real name is, and how he got the nickname 'Pish'!! Thanks all, and keep entering often to increase your chances of winning!